Have you ever had the craving for Chinese food but don't want to pay the price? 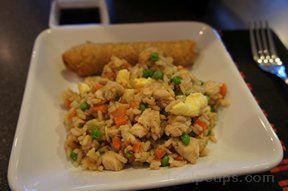 Make your own fried rice in the comforts of your home. You'll enjoy it even more. Top it with some sliced green onions and enjoy. 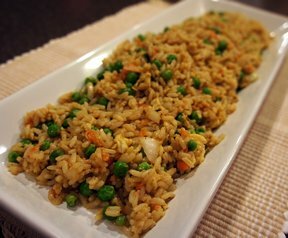 If using uncooked rice, prepare rice as directed on package, then allow to cool. Scramble the eggs in a small pan over medium heat, creating small bits of egg. 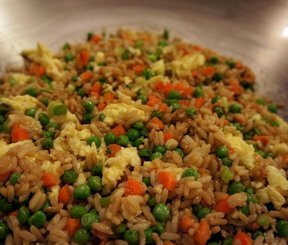 In large bowl, carefully toss peas, grated carrot, scrambled egg, diced onion and cooled rice together. Melt margarine in a large frying pan over medium-high heat. 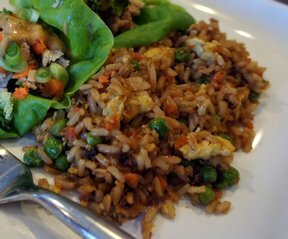 Dump the bowl of rice/vegetables/egg into the pan, then add the soy sauce. Cook for 6-8 minutes, stirring often. Salt and pepper to taste. As a variation, may sauté bite size chicken (or pork or beef) pieces first, then proceed with recipe and add meat to frying pan with rice mixture to create a meal. "Definitely use green onions and don't overcook them. I think this is what gives it that fresh taste."